Viewing 0 current events matching “meetup:event=224842443” by Date. Viewing 1 past event matching “meetup:event=224842443” by Date. In September, we'll be meeting at Urban Airship for a panel with several of their talented women. The theme will be "Never Stop Learning." 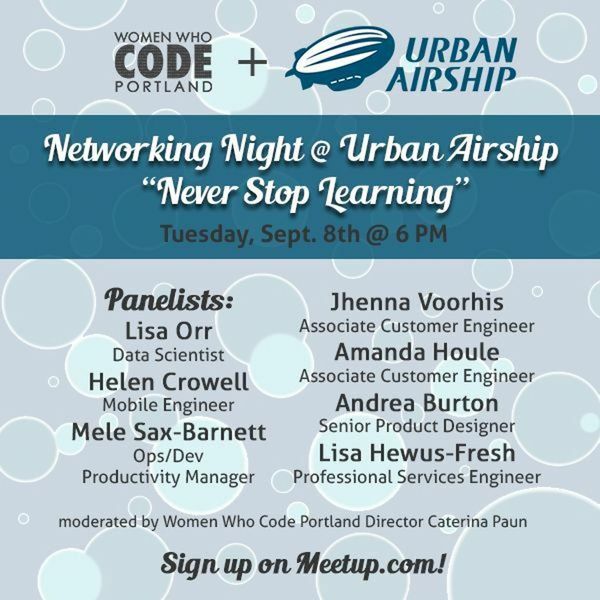 6:30-8:00 - Women Who Code Intro + Urban Airship Demo + Panel: "Never Stop Learning"
Urban Airship helps leading brands engage their mobile users and build high-value relationships from the moment customers download an app. Thousands of companies and some of the most demanding brands in retail, media & entertainment, sports and travel & hospitality, trust Urban Airship to deliver the mobile moments that matter to their customers and to their business.